After you’ve made the decision to get breast implant surgery, you have to figure out the details! You’ve got two options when picking out an implant shape: round and teardrop. Round implants contain either liquid silicone or saline that moves freely, allowing the implant to alter its shape; teardrop implants, also known as contour implants or anatomical implants, are made with either saline or a solid-form cohesive gel – cutely nicknamed “gummy bear” implants – that maintains their shape no matter which direction turned. Teardrop implants have an attractive promise, but they also have some drawbacks that patients need to be aware of. Teardrop implants have a textured shell that keeps them from rotating inside the breast; a worry unique to that type, as round implants can rotate freely because of their symmetry. However, the textured shell is not fool-proof, and teardrop implants can rotate creating an unnatural appearance. Rotations are rare. They are usually caused when breast tissue does not properly adhere to the implant or when the implant “pocket” is made too large, giving the implant room to move. 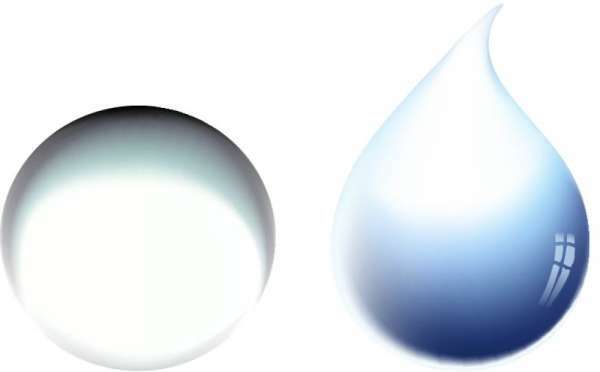 Teardrop implants come in a limited number of sizes, and are typically measured by their height and projection. Because they have a more anatomical form than round implants, surgeons must take extra care to make sure that the right size of implant is used, based on a patient's chest dimensions. Breast surgery candidates may find the idea of cohesive gel implants more comforting when the discussion of possible ruptures comes up. Round implants are filled with either liquid silicone or saline, and when these rupture, their filling leaks out. Because cohesive gel implants are a form-stable product that does not ooze or leak, they will maintain their shape in the event of a rupture. Advocates of teardrop implants say they provide a more natural appearance than round implants. Detractors say that round implants are more natural because they can alter their shape, the way natural breasts do. Since teardrop implants maintain their shape no matter which way they are turned, they will stay in a teardrop form, even when a woman is laying on her back. This creates an abnormal appearance, whereas round implants, in this situation, would look more natural. The textured surface of a teardrop implant sticks to the inside of the skin more often than the smooth round implants, a situation which can cause awkward-looking wrinkles or ripples to appear on the skin. Teardrop implants are necessarily firmer than round implants. Depending on whether the implant is placed subglandular or submuscular, this could cause the breast to have a firmer feel than what is considered natural. Still, at least one study has shown that most women who received cohesive gel teardrop implants were happy with how their augmentation turned out. The decision to go teardrop or round is a personal one and based largely on aesthetics. Even advocates of teardrop implants do not recommend them for use if a patient wants extremely large breasts. Teardrop implants are best for patients who desire a more proportionate look. The majority of plastic surgeons in the United States tend to recommend round implants. Doctors do consistently recommended the teardrop implant for breast reconstructions or petite patients with little natural breast tissue. If you’re getting surgery to correct a chest deformity, then round liquid implants should be strongly considered; gel implants can accentuate the deformity, while liquid ones will fill it in better. The choice is between you and your doctor, who can guide you through the decision-making process, let you feel each type of implant, and show you before and after pictures of each type.